A familiar sight for Formartine fans this season and Garry Wood added two more goals against Buckie. Formartine United reached the quarter-final of the Breedon Aggregates Highland League Cup with a comfortable win at Buckie Thistle on Saturday. 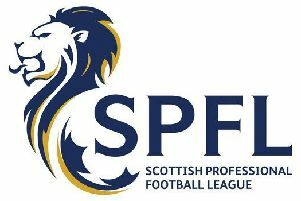 They set up a home clash with Brora Rangers thanks to three first half goals which effectively killed off the tie. United put 10 past the Jags in their last encounter and wasted no time in setting their sights on goal. Opening exchanges in blustery conditions were end-to-end but the visitors were first to create a chance when Gauld had a shot blocked in the fifth minute. Formartine went ahead in the 13th minute through prolific marksman Garry Wood. He turned McKinnon on the edge of the area and drilled a low ball past Salmon. Rustiness from both sides was not aided by the windy conditions and moves tended to breakdown prematurely but even in this Formartine had better shape and tempo. Buckie managed to sustain a period of pressure but fell further behind in the 28th minute. A Masson cross fell to Smith and the full back drove the ball cleanly past the diving Salmon. Just before the interval the visitors virtually wrapped up the tie with a second goal from Wood. He picked up a ball over the top and split defenders Wood and Dorrat, dummied the keeper and flicked the ball into the empty net. The Jags were an improved side after the break without really getting on top of their opponents and it made for a rather scrappy affair. Thistle were winning many “second balls” and consequently made it difficult for United to provide ammunition for Wood and the lively, but under–fed Gauld. In the 68th mninute the home side put a bit of pressure on the Formartine goal and it paid off. An Angus chip was headed away by Smith and knocked back in by Taylor. The ball bobbled about in front of the right upright before falling to substitute Andy Low about eight yards out and he clipped it beyond the reach of Reid. little change out of the Formartine rearguard and United still looked menacing on the break. A 50-yard dash by Gauld took him into the Jags’ box but just as he was about to deliver the final blow, the ball bobbled visibly and allowed Salmon to knock it away. As time went on, the heavy pitch created tired legs and the pace dropped a bit. Formartine gained slightly more possession, got back in enough control to run down the clock, emerge without injury and progress to the next stage. Buckie Thistle: Salmon, Wood, Napier, Dorrat, McKinnon, Cheyne, K Fraser, Taylor, J Fraser, Angus, Adams. Substitutes: Wyness, Scott, Gauld, Carrol, MacRae, Low, Sim. Formartine United: Reid, Dingwall, Smith, Crawford, Henry, Anderson, Rodger, Masson, Gauld, Wood, Barbour. Substitutes: Keith, Michie, Bagshaw, Berton, Thomson, MacDonald.